The almost 300 page color book is published through Hal Leonard books, and is available in many retail outlets such as Barnes and Noble, as well as Amazon online. It has many never-before-seen photographs of these artists as well as Rhodes history. 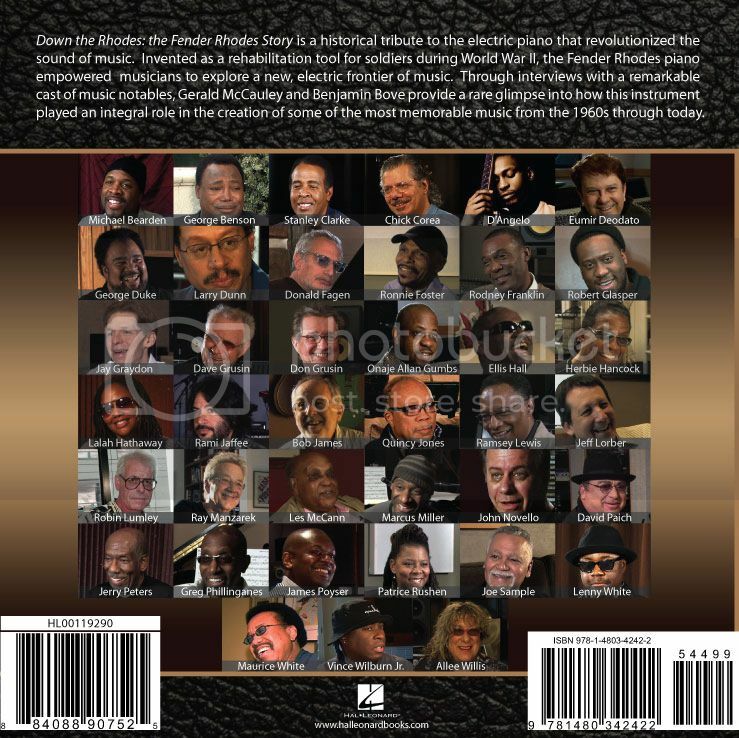 The book includes the exclusive Blu-Ray HD version of the documentary features film, while the standard DVD version is available on www.fenderrhodesstory.com separately. A great thanks to everyone from CBS Musical Instruments who gave their time and input for the film including John McLaren Jr., John McLaren Sr., and Steve Grom. I have to give a special thanks to Steve Woodyard, for being an invaluable resource, expert, and friend on everything Fender Rhodes. The same thanks to Mike Peterson as well for his help and input. 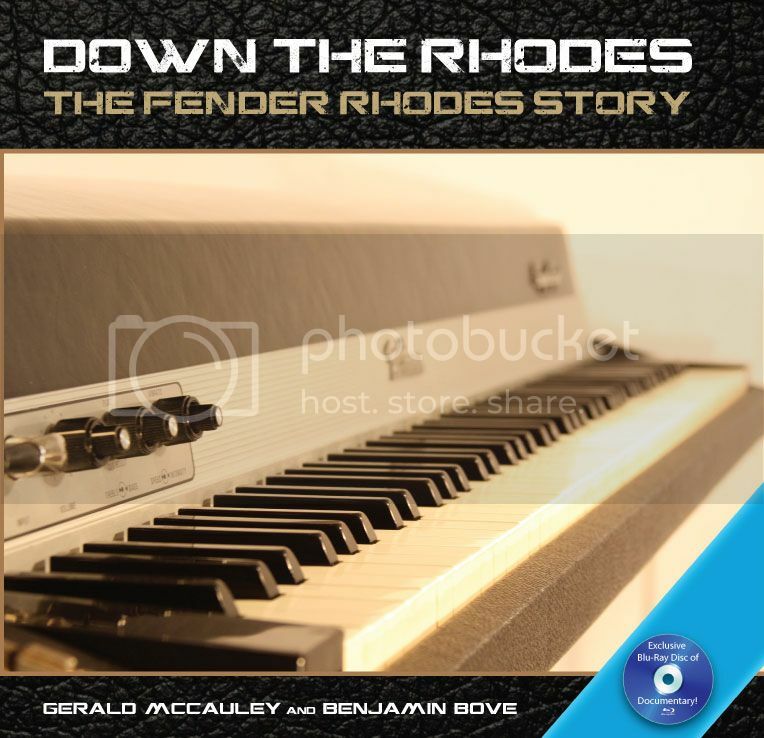 My appreciation goes out to James Garfield and Freddan Adlers for pioneering Fender Rhodes history, and creating a community to gather enthusiasts at FenderRhodes.com. 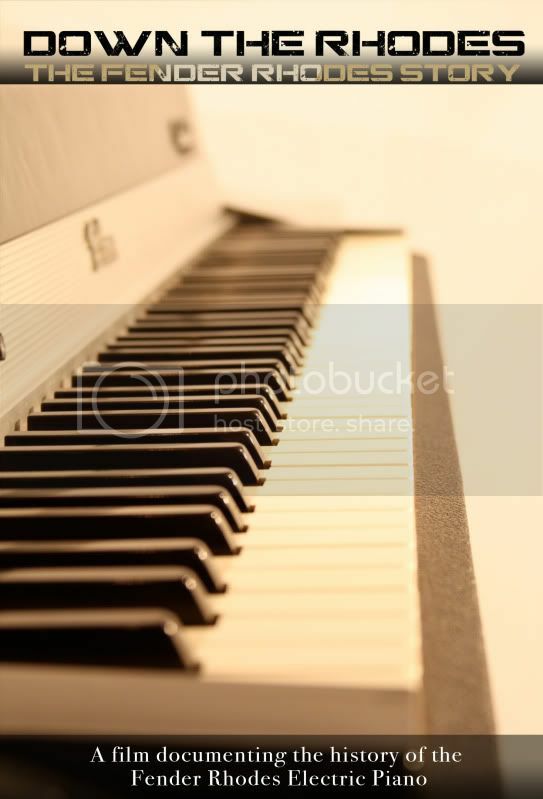 Their work has been fundamental in keeping people connected and interested in Fender Rhodes pianos. Thank you to Jim Wray and Mark Daniel for their contributions to the film. Thank you to John Novello for providing his audio narration archives. Thank you to Carol Rhodes-Rice and Patricia Rhodes. We could not have imagined the overwhelming support from the music community on this project. I can only hope this film can also educate and influence lives where we can share in this story together. Please visit www.FenderRhodesStory.com to request a DVD copy or a digital MP4 download, and follow us on twitter / facebook for upcoming webisodes and other bonus material. We appreciate the donation. I hope that my contributions over the years on this forum and dedication to Fender Rhodes have played a small roll in keeping some of these pianos alive and well. I also hope that this community remains connected so we can all continue the legacy of Harold Rhodes and his electric piano. Thank you to everyone! What a find and great story! Thankyou from a Rhodes lover in Australia! Great to see someone who has researched and compiled this great historical and informative story with pics and artists on a keyboard that has shaped music for over 50yrs. Can't wait to get my copy and watch the DVD, and yes I have gladly contributed the suggested $ to cover costs! Happy to have paid the cover costs and look forward to getting the DVD. All the best from England. This sounds excellent, Ben! payment sent. I can't wait! Sent my donation in a few days ago. Can't wait to get my copy! thanks for all your effort making this docu happening. I sent my donation and look forward to watching the documentation. Electric Piano Technician in New Haven, Ct.
Can't wait to get my copy of the DVD! Can't wait to get the DVD! Well crap. I'm in the same boat as Kenneth! According to my computer's DVD player, the disc is blank. Edit -- Already got replies from Ben and Gerald that they're sending me a new copy first thing today. That was quick! Hey guys thanks for the replies, our manufacturer said it's possible a few blanks or defective discs are created in a large production run. If anyone has any problems with the disc please send me an email to benbove@hotmail.com and we'll immediately send you another copy. Wow! I got my copy yesterday. perfect timing,since my drummer and bass player came over last night, and we watched it together. This is very well done, Ben! One of the best documentaries I have ever seen. I loved your ' Hitchc**k moment' towards the end. It must have been awesome to interview all of your keyboard heroes. I have only met one of those artists that you interviewed and that was great, although a bit nerve wracking since I was his tech for a day. Excellent job! Now you need to raise the price for non forum members and sell it on Amazon, etc. Then, you need to work on a supplement (or a seperate documentary) touching on Wurlitzers more, and Hohners, etc.! Got mine yesterday and had no problems with it. Very well done Ben, I'm very impressed with the number of famous artists that you interviewed. Must have been a lot of fun to do. I really enjoyed watching it and my 14 year old daughter enjoyed it as well. Not too many 14 year old girls really appreciate the Rhodes but she does! I am also very impressed with how professionally put together this is, the audio quality, the video quality, the editing, fantastic! Thanks very much for the compliments! It's been a long process and we made sure to do it right. All the audio was captured direct from each Fender Rhodes so that we could eliminate any room noise etc. that might affect the performances. As far as the digital download yes we have considered this avenue, though it's not currently available in this format. We may figure this out for the future if enough people are requesting it. Thanks again! I'm looking forward to receiving it. Ben and Gerald, I received my DVD on Monday and WOW! This DVD is GREAT! The sound, video quality, concept, everything about this DVD is GREAT! Very well done guys and thank you for having the guts to develop and put out this DVD. Finally got to watch it tonight. That was a very, very enjoyable two hours!! Unbelievably well done, and it really touched on so many key Rhodes moments through the years. I only wish that you miked the two people who sang along when they were playing. i forgot who it was, but the one guy did a Stevie impersonation, and it was awesome! So what's the expected delivery time to Spain? The other was Patrice Rushen. i forgot who it was, but the one guy did a Stevie impersonation, and it was awesome! Incidentally, I've forgotten who that guy was as well. I recall it being a bit unclear because the segment was about a certain player but just as that performance started, the narration was about Gerald McCauley. From the profile shot, I couldn't tell who was at the keys. But nitpicking aside, I thoroughly enjoyed the production. Learned a little about the Rhodes that I haven't read anywhere else and was introduced to some players I was not previously familiar with. Is one of the most significant keyboard session players, on many huge records: Songs in the Key of Life, Michael Jackson Off the Wall / Thriller, and hundreds of other records. No wonder ( no pun intended) that his playing sounded exactly like the record, but his singing sounded like Stevie also. I always assumed that Stevie did all of his own Keyboard tracks. I too was surprised by how good Greg Phillinganes' Stevie Wonder voice sounded. I've heard him play for years on assorted things (love his work on the Rhodes on Donald Fagen's Nightfly album) and even saw him backing Boz Scaggs a couple years ago, but I hadn't heard him sing before. Me too. Learn something new every day I suppose! He has an amazing voice.. he sang with Eric Clapton mid-80's and into the 90's. You'd see plenty of videos on Youtube with him, Clapton & Phil Collins. He also toured last year with Herbie Hanc**k. I went to see them in the Grand Canal Theatre, Dublin. Herbie introduced Greg as his second piano player. He made a big deal of having managed to get Greg on tour with him because he is often in demand. Of all the songs he sung that night.. his un-mic'd performance of Imagine was amazing.. what a set of pipes that man has!